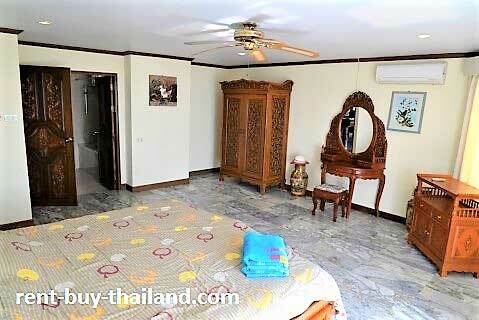 Rental Price 50,000 - 80,000 Thai Baht per month depending on season and length of stay. 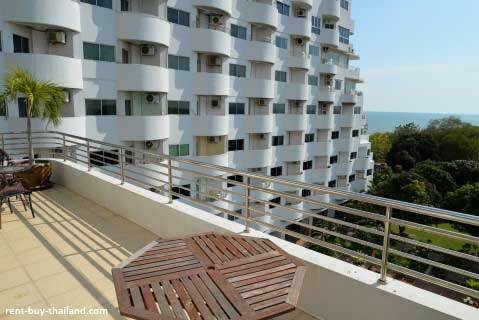 This is a superb luxury apartment at Grand View, situated on the beach with lovely sea views. The apartment is very large and is superbly decorated and tastefully furnished throughout. The apartment consists of very large open plan living, dining and kitchen areas, two large bedrooms, three bathrooms and three balconies. Being fully furnished with some stunning handmade teak furniture it is ready for you to move in to now! The European style kitchen is fully equipped with all you need, including pots and pans, crockery and cutlery etc, along with an oven, hob, extractor fan, microwave, refrigerator, a water filtration system and plenty of storage space. The main living area is furnished with a large sofa and arm chair, a coffee table, storage and display units, a TV and DVD player, along with access to the largest balcony via the large sliding doors. The dining area features a stunning wooden hand-carved, glass-topped dining table with chairs. Both table and chairs have been carved with intricate detail, which you'll want to study for hours! There is a lovely hand-carved wooden bar area, complete with glasses; a great asset if you like hosting parties. 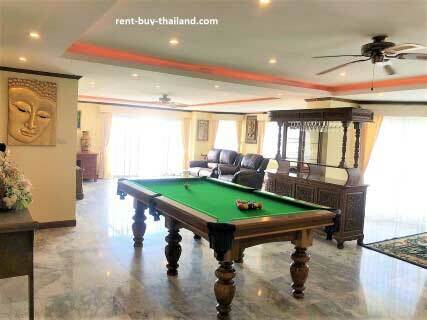 There is also a large pool table in the main living area, complete with cue storage and scoring board. The three bathrooms are all modern, fully tiled and have been finished to a high standard, they all include a large work surface housing a basin and storage units. The two en-suite bathrooms feature bathtubs with showers over the baths, and the third bathroom, accessed from the main living area, contains a large walk-in shower. Both bedrooms are very large and are furnished with hand-carved wooden bedroom furniture including large double beds, wardrobes, drawers, dressing tables with stools and bedside cabinets. Each has an en-suite bathroom and access to one of the balconies via large sliding doors. The three balconies each offer stunning rural and sea views. There are two smaller balconies accessed from the dining area and the second bedroom, and one very large terrace balcony, overlooking the pool, accessed from the living area and the master bedroom, with balcony furniture included. A fantastic space to relax and enjoy the tranquil atmosphere. The apartment also benefits from marble flooring throughout, along with curtains, down-lighting, air conditioning and ceiling fans. 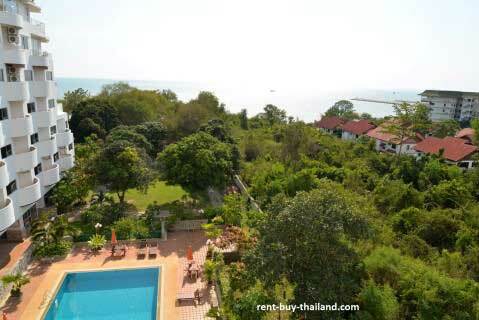 Grand View Condo is located in the peaceful area of Baan Amphur, 20 minutes from Central Pattaya. Nearby there are some must see attractions such as Nong Nooch Tropical Botanical Garden, Pattaya Floating Market, as well as golf courses and good transport links. The Baht bus route runs past the complex and costs only 20 Baht to Pattaya. The Condominium has beach front access to a lovely tranquil beach, perfect for relaxing days of sunbathing, swimming in the sea and watching the beautiful sunsets. Residents here can benefit from a well maintained building, which has recently been refurbished, and have use of the large swimming pool, which includes a children's pool. There is also free parking, a snooker room, elevators, 24 hour security and key card access for the entrance door. Rent-buy – Flexible easy payment plans are available to help you own your condo - no credit check needed. Other condos around the area are available, please inquire for more details.